Aller Vale handled jam pot - 3⅜" (85 mm) high, 5½" (139 mm) long. You'd better fill me up with jam. Aller Vale's history goes back to 1865. 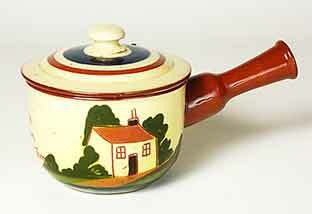 The Torquay company originally made earthenware domestic goods. John Phillips started the Aller Vale Art Pottery in the 1880s after the original pottery (J Phillips and Co) was damaged by fire. In the last decade of the nineteenth century the company gained public approbation when its wares were stocked by Liberty & Co. of Regent Street, London. After the death of Phillips in 1897, the company was acquired by Hexter Humpherson & Co., who amalgamated it with another of their acquisitions, Watcombe Pottery, and the new firm was known as Royal Aller Vale & Watcombe Co. The company continued to produce pottery until 1962.